Where did all the infants go? Last September, the U.S. government announced that our birthrate fell to "another record low" in 2012, following a long, steady slide since the Baby Boom after World War II. It goes without saying that, morally speaking, there's nothing wrong with this. It's natural, in a way. All over the world, birthrates tend to fall along with economic development, for numerous reasons including (a) the move away from a labor-intensive small-farm economy and (b) women's ascendance in the workforce, which uses time that used to be devoted to child-rearing. Families in richer countries tend to have fewer kids. In places like Japan and Western Europe, national populations are actually peaking. The thing about an increasingly childless economy is that it has major implications for consumption. 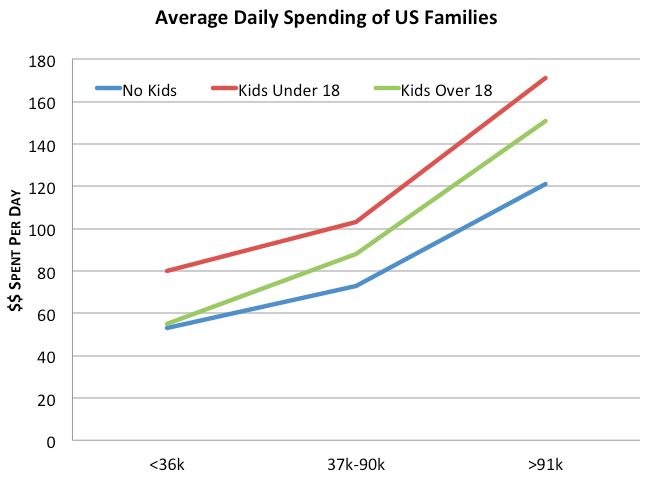 Just look at this new data from a Gallup survey released today on the average daily spending of families. 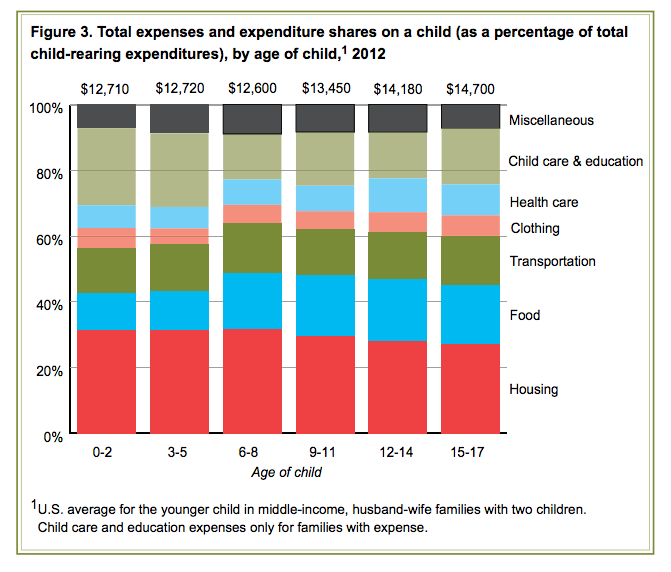 Even after you control for income, age, education, and marital status, families with young kids spend more every day. These are the sort of spenders you want in a weak economy following a great deleveraging. What are parents spending on? Not just books, toys, and games. The Department of Agriculture (weirdly enough) annually surveys the many ways we lavish our kids with spending, to the tune of about $14,000 a year. The overwhelming majority of money goes to the basics: housing, food, transportation, and education. Housing is kinda funny, because young children tend not to have their own housing units, unless the parents are extremely well-off and the children are terribly misbehaved. The survey estimates the housing portion of spending by trying to account for a few factors: the cost of an extra bedroom, the cost of moving into safer communities with better schools, and the cost of buying homes with larger yards. It's rough, but there it is. 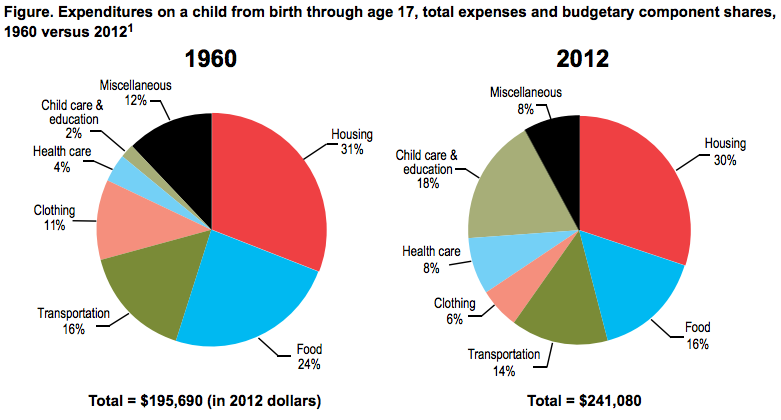 And, for a bit of trivia, here's a look at how the cost of raising kids has changed of the last 50 years. The major action here is that food and clothes got really cheap relative to child care and education (more of that here). The upshot is that when we think about economic growth, some of the most discussed variables on editorial pages and cable news include policy choices like Obamacare and tapering and tax rates, or international events like China's shadow banking system and the Crimean invasion. And that's fine: policies and global events do shape lending and spending behavior. But buried underneath these headlines is the glacier of demographics, the steady and unyielding force of human numbers to shape the economy. The drop in U.S. fertility rates in recent years has almost certainly had a negative effect on consumer spending (and, in turn, lower birthrates are probably an outcome of the recession). In particular, childless couples don't need space for more kids so they're less likely to buy homes in the suburbs, depressing demand for housing in an economy that badly needs to sell more homes. Once again, couples and families can do whatever they want, it's their lives. But writ large, smaller families and less household formation deprives the U.S. economy of housing and transportation spending, which has historically accounted for half of family expenditures. You can't legislate demographics. But it doesn't mean you shouldn't worry about it.